This is a shot of my desk top, literally taken a few moments ago. The shot shows a couple of my writing muses. 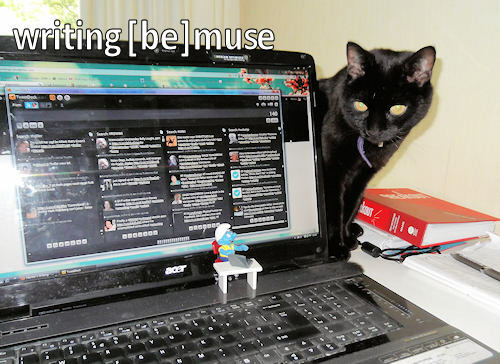 On the laptop – a little Smurf set – he’s sitting at a desk with a laptop, writing, also. Nothing like a smack-in-the-face reminder of what I should be doing – instead of that big Tweetdeck thing on my screen. Looking slightly less muse-like is Rocky, one of the cats around here. Rocky likes to sit close to me while I write – sometimes. On the other side of the laptop, I have a small square bowl with a siamese fighting fish in it. They are all the rage in pet stores over here at the moment, due to their ease of keeping, and pretty colours. Perhaps that’s the attraction for the cat, though?